I know that Whitechapel Haymarket is probably an odd thing to find in an advent calendar, so let me explain. 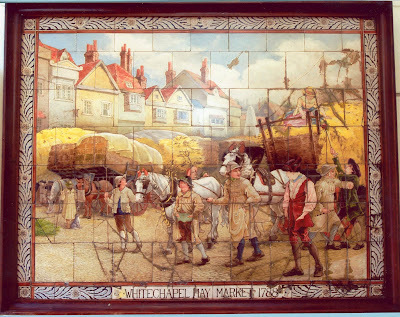 I got it into my head that I should include some shepherds and I remembered that there used to be a tiled picture in the lobby of Whitechapel Library with some besmocked country lads. I associated those smocks with the hiring fairs that shepherds would attend and assumed that they were shepherds - I think I had in mind the scene in Far From The Madding Crowd where Gabriel Oak goes to a hiring fair. Thus started a quest to find the picture and my bumpkins. The very helpful archivist at Whitechapel Art Gallery, which now incorporates the old library, told me that the tiles has been stored away when building work started, but I could find a picture at the Tower Hamlets Local History Library and Archive. So off I went on a damp. grey afternoon last week to the comforting fug of the archives where the charming staff unearthed a box of photos for me. And there it was - carts, horses, hay and my bumpkins. Probably not shepherds after all now I've seen it again. But I do like them. The dreamy looking chap in the middle of the picture, a slip of greenery tucked into his hat, always caught my eye. So I give you today a fanciful glimpse at rus in urbe - bumpkins in Whitechapel. marvellous, i love the horses' red tasselled ear codpieces. Love the tiles, what a shame they're not on view at the moment, and good for you for keeping on their trail. Lovely picture - all the more appreciated because of the trouble you took to get it. I love that you made a journey specifically to unearth this picture; it's very nice and if not shepherds, I am sure some of these men did some shearing in their fine smocks! A lovely picture and a lovely story. Well done for tracking it down.